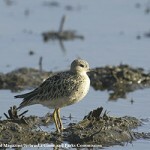 Description: Bill is shorter and thicker than in Wilson’s Phalarope. Shows white wing stripe in flight. Breeding female is more colorful than the male. Distinctive chestnut coloring on front and sides of neck; dark gray head; lacks white eyebrow stripe; highly contrasting dark and buffy stripes on back; and black spotting on flanks. Male is duller with less constrasting stripes on the back; a white eyebrow stripe; lacks black spotting on flanks; and has a brown wash on breast. Winter adults are blue-gray above with white stripes and white below; and possess a dark ear patch. Juvenile similar to winter adult but buffy instead of blue-gray; also has buffy forehead. 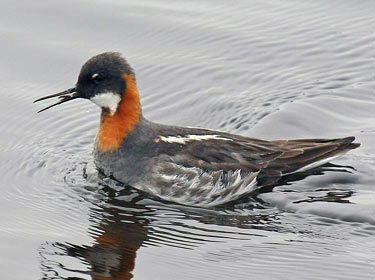 Behavior: Red-necked Phalaropes when feeding will swim in fast, small circles creating a whirlpool to bring insects from the bottom up to the top. Habitat: Migrants can be found in open water areas of marshes and shallow lakes foraging for the abundant invertebrate life. 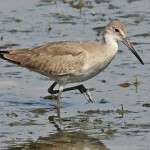 Where in Nebraska: Fairly common spring and fall migrant in western Nebraska, less common in southeast. 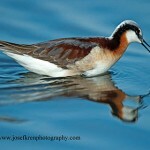 Fun Facts: All female phalaropes do the courting, while the males incubate the eggs and care for the chicks.